Can The Peer Economy Deliver Profits? : All Tech Considered Postmates is among a group of app-powered services popping up around the U.S., with a simple promise: deliver food or merchandise in as little as an hour. But can they succeed where Kozmo.com didn't? Can The Peer Economy Deliver Profits? Postmates appeals to workers looking for a secondary income, CEO and co-founder Bastian Lehmann says. Josh Gibbs normally wouldn't leave his apartment in Northeast Washington, D.C., pick up a loaded pizza from a restaurant in Chinatown, bike to a complete stranger's apartment, drop off the pizza and leave without any cash exchanging hands. But last week, he did just that. And truth be told, he kind of loved it. "It's exciting. It's just fun," he says. "When the app goes off, when it beeps, I get this little adrenaline rush. I can make some money. It's like a game." The app he's referring to is Postmates, a service that allows users in five cities — D.C., New York, San Francisco, Seattle and, as of last month, Chicago — to order any item, from any store or restaurant, any time of day, and receive it within an hour. The couriers are everyday people like Gibbs, who's a full-time teacher, and all the money is transferred through a smartphone app, no physical cash involved. Think of it as the Uber of home delivery. Gibbs, 23, is an avid biker, and he had toyed with the idea of making some extra money as a courier before. But he didn't know where to start. Along came Postmates, which made the job seem not only appealing but also accessible. Gibbs started working for the startup three days after he applied. "It's something I can do on the side. I can work during the dinner rush; I can work after the school year," he says. "I'm on my bike anyway." 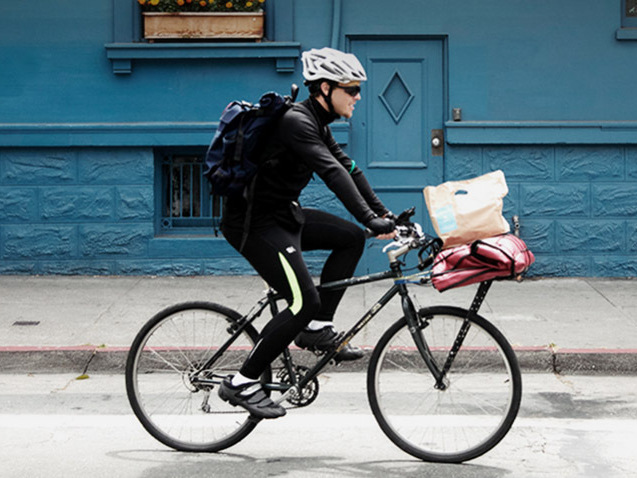 Postmates is part of a burgeoning cohort of tech-savvy on-demand delivery services. In D.C., there's Urban Delivery; in San Francisco, Shyp; in Chicago and Manhattan, eBay-owned Shutl; also in Manhattan, UberRUSH, which entered the game just last week. It's also part of a larger phenomenon that MIT researcher Denise Cheng calls the peer economy — "platforms that allow people to monetize skills and assets that they already have," she says. This includes Uber, TaskRabbit, Airbnb and Etsy, among some of the larger players. The biggest appeal of these platforms, she says, is the potential of making money with a low barrier to entry. Amateur crafters don't have to open a storefront to sell their wares on Etsy. Homeowners don't need to devote their career to hospitality to list their place on Airbnb. And most Postmates couriers don't have prior experience with that kind of job, says CEO and co-founder Bastian Lehmann. They're simply doing it for the money. "Additional income is the No. 1 thing for most of the people," Lehmann says. A lot of Postmates' workers are artists or musicians, he says. "They like a secondary income. They have a lifestyle that's probably not supported by a 9-to-5 job." That full-time-work model is no longer automatically attainable, Cheng says, and the peer economy provides an appealing alternative. "You're able to generate income without having to pile on skills," she says. There is an intangible appeal, too, to working in the peer economy. The companies often come with a promise of bonding with other people on the platform — Postmates organizes courier happy hours, for example — meeting interesting people in the community and minimizing environmental impact. It's a charismatic work model, Cheng says. Despite its success so far, the peer economy isn't likely to replace the traditional model of gainful employment anytime soon. Lehmann wouldn't say how much Postmates workers make in a week. Gibbs made about $50 in his first week on the job. It's nice pocket money, he says, but it won't pay his rent. The low barrier to entry also means there's a low barrier to exit: People can stop working at any time with little or no consequence. So the success of the companies, Cheng says, depends on continuously recruiting new workers. "Most of them provide cheap, convenient amenities at the tap of a smartphone app. Few of them are profitable on a corporate level. And together, they've formed the backbone of a strange urban economy: one in which massive venture-capital injections allow money-losing start-ups to flourish, while providing services that no traditional, unsubsidized business can match. It's an economy built on patience, and the hope that someday, after the land grab is over and the dust has settled, a better business model will emerge." This patient economy has been waiting a long time already. During the dot-com era, a decade and a half ago, venture capitalists poured money into Kozmo.com, a startup that promised one-hour delivery service. Sound familiar? Though popular among customers, its high costs — warehouses to store the orders and health insurance for couriers, among others — resulted in a net loss of more than $25 million in 1999, according to the Wall Street Journal. The company collapsed in 2001. Lehmann says Postmates is learning from Kozmo.com's failure: no warehouses, using better technology more efficiently. "We obviously try to think about that a lot," he says.